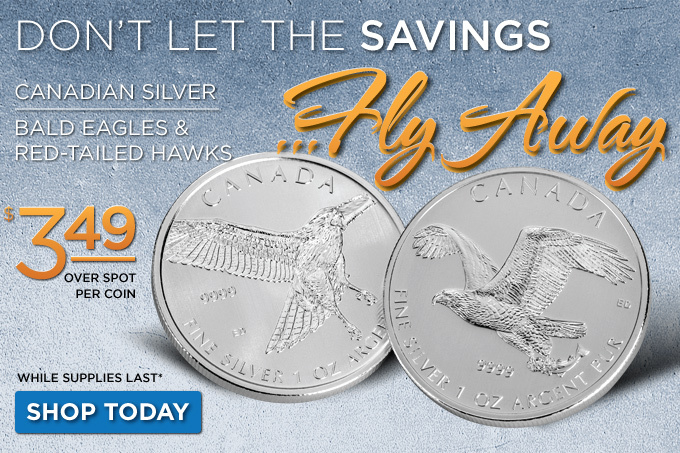 While supplies last we’re offering the wildly popular Silver Canadian Bald Eagle and Red-Tailed Hawk coins for just $3.49 over spot per coin. If you’ve never seen a modern silver coin from the Royal Canadian Mint then you’re in for a treat because the quality on these coins is amazing! The detail and finish is bar none and these coins (part of the Birds of Prey Series) will not last long because their mintages are capped. Get your Bald Eagle or Red-Tailed Hawk today!